Chicago Lawyer Magazine published this piece in print in May 2018. Fifteen hours each month is more than enough time for Ann E. Pille to provide free legal counsel to those most in need. A partner at Reed Smith’s financial group and mother of two young children, Pille has time commitments that keep her from the long, complicated pro bono cases she took on earlier in her career. But that does not prevent her from donating what time she does have to fill a need she knows is there. 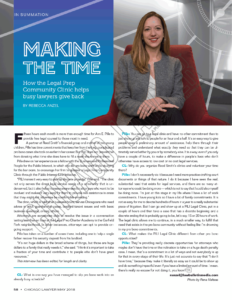 Pille drew on her experience as a fellow with the Business and Professional People for the Public Interest, in which she did pro bono work while studying for the bar exam, to encourage her firm to sponsor a Legal Prep Community Clinic through the Public Interest Law Initiative. The clinic, which is held after business hours, serves Chicagoans who need advice in adult guardianship cases, landlord-tenant issues and with basic business questions, among others. Attorneys are sometimes able to resolve the issue in a conversation lasting less than an hour at the Legal Prep Charter Academy in the Garfield Park neighborhood. In other instances, attorneys can opt to provide ongoing support. Pille has taken on a number of cases there, including one to help a single father recover his security deposit from his landlord. Chicago Lawyer: What is one way you have managed to slip pro bono work into an already busy schedule? Pille: You can go to a legal clinic and have no other commitment than to just show up and talk to people for an hour and a half. It’s an easy way to give people even a preliminary amount of assistance, help them through their problems and understand what exactly they need so that they can be ultimately served either by you or by somebody else. It is a way, even if you only have a couple of hours, to make a difference in people’s lives who don’t otherwise have access to low cost or no cost legal services. CL: Why do you organize Reed Smith’s clinics and volunteer your time there? Pille: I don’t necessarily do it because I need more practice drafting court documents or things of that nature. I do it because I have seen the real, substantial need that exists for legal services, and there are so many attorneys who could be doing more — which is not to say that I could also myself be doing more. I’m just at this stage in my life where I have a lot of work commitments. I have young kids so I have a lot of family commitments. It is not as easy for me to devote hundreds of hours in a year to a really substantial piece of litigation. But I can go and show up at a PILI Legal Clinic, put in a couple of hours and then take a case that has a discrete beginning and a discrete ending that is probably going to be, let’s say, 15 or 20 hours of work. The legal clinic allows me to continue, in a much smaller way, to fulfill that need that exists in the pro bono community without feeling like I’m drowning in my pro bono commitments. CL: What makes the PILI Legal Clinic different from other pro bono opportunities? Pille:They’re providing really discrete opportunities for attorneys who maybe don’t have the time or the inclination to take on a huge death penalty case. I mean, that’s a commitment in a lot of ways and not everybody is up for that in every stage of their life. It’s just not accurate to say that “I don’t have time,” because they make it literally as easy as it could be to show up and do something impactful even if you have a limited amount of time. I mean, there’s really no excuse for not doing it, you know?